Let's all pile on Milton! Torii Hunter, one of my favorite players, won't even consider playing for the Cubs. He's heard the stories from former teammates LaTroy Hawkins and Jacque Jones. The Wrigley faithful are racist, you'll get hate mail, it's almost as bad as Boston, etc., etc. The thing that never gets reported is that the mistreatment extends to the local media. I've always felt LaTroy and Jacque were given unnecessarily harsh treatment, especially by some of the sports talk-jocks in this town. Now, along comes Milton Bradley. He gets in an argument with an umpire, and according to Bradley, the umpire initiates contact with him during the argument. MLB suspends Bradley for two games, and he thinks it's patently unfair, so he appeals the suspension. When the suspension is reduced to one game, Bradley complains that he still didn't get a fair shake... and here's the shocker to no one, especially Torii Hunter, LaTroy Hawkins, Jacque Jones, and your's truly: The Chicago media starts harping on why Milton Bradley is selfish. These are the kinds of articles that are really quite unfair. I normally like Steve Rosenbloom, but today's comments are wrong. If Milton Bradley thinks he has been wronged, he has every right to appeal his suspension. Sure, I would have preferred Milton take his two game suspension while he was hurt and would otherwise have missed the game, but that's like agreeing to an unfair suspension from work while you would otherwise be on vacation. Yeah, you weren't going to come in anyhow, but if the suspension is unfair, then you fight it. We don't stand for injustice in our every day lives, but we demand it from our sports stars? Alright /rant. I disagree with Steve. I'm sure some will disagree with me. The important part is that we let MB have a day off, and we close that .5 game gap with the Brewardinals and reclaim our rightful place atop the central. 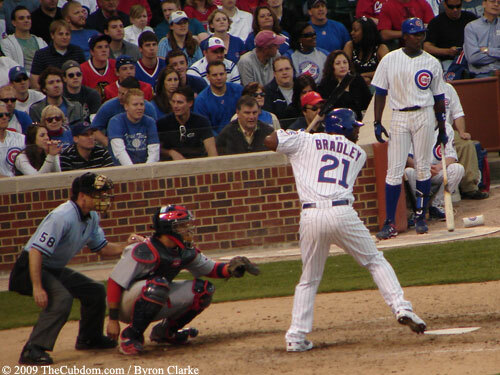 Milton Bradley bats against the Cardinals at Wrigley Field. Bob Melvin is out as the Diamondbacks manager... it's time for the 'Bob Brenly is leaving' rumors to start popping out of the woodwork. As for me, I really like Len Kasper, but I can take-or-leave Bob. Unlike Steve Stone, Bob Brenly always seems to defend players, as befitting a former, and prospective manager. I want someone who will tell it like it is in the booth. Me! Last week, Jerry Moyes, the owner of the Phoenix Coyotes, placed his team into bankruptcy, touching off a showdown between the NHL and the U.S. Bankruptcy Court. As explained well in this WSJ Article by Matthew Futterman, the Bankruptcy Court is obligated to accept the highest bid for the team, regardless of the NHL's wishes. Unfortunately for NHL Commissioner Gary Bettman, the highest bidder is a Canadian gentleman named James Balsillie. Balsillie is the founder of Research in Motion, the company that makes Blackberrys. Balsillie's plan for the Coyote's, like his plan for the Pittsburgh Penguins that he tried to buy several years back (which the NHL blocked), is to move the club to the Copps Coliseum in Hamilton, Ontario. In the past, Balsillie has gone so far as to sell 12,000 season tickets to prove that the team has a market and could compete with the Maple Leafs. Now, what does this have to do with Baseball? Can you think of any teams that might be subject to a bankruptcy judge's whims? Can you think of any other teams that are being sold? Can you think of any other teams where the seller, before going into bankruptcy, told the bidders that the best bid would be the one that maximized post-tax profit (rather than the largest bid wins)... but now that the parent company is in bankruptcy those considerations could be for naught? I'm really scraping my brain here... oh wait, there is that one ball club. What was it's name again? Oh, right! The Chicago National League Ball Club (dba Chicago Cubs). No, I don't expect the Phoenix proceedings to have much of an impact on the sale of the Cubs. It would be quite late in the game to derail the Ricketts' purchase of our team (although if this had happened a year earlier, my guess is Mark Cuban would be the new owner), but the world should be watching with bated breath because the legal precedent that allows Leagues to determine who can be an owner and where those teams can play is shaky at best. If the Bankruptcy judge sides with Balsillie, that's just one more stone thrown at the window of League self-determination. Where do I come down on this? Well, the WSJ gives us a nice peak into the debt structure of the Coyotes. The NHL is in the pole position and should receive the full $37 million it is owed, no matter who buys the club. Next is Michael Dell's private equity firm which would receive it's $80 million in most circumstances. And finally, the creditor who would be most sensitive to any price fluctuations is Jerry Moyes. He has $104 million of unsecured debt, so the club would need to sell for $221 million (plus legal fees) for him to receive payment on all of his personal loan to the club. Normally, I would side with Moyes. It's his money that would be lost if the club sold for less, so he ought to be able to choose whom to sell it to, and he already has - in lining up a deal with Balsillie... but this isn't a normal situation. Remember that part about the Coyotes playing in a taxpayer funded arena? The original lease, which gets torn up in bankruptcy court, called for a $700 million fee if the Coyotes left Phoenix, and so I am arguing that the party most harmed here is not Jerry Moyes, Jim Balsillie, or the NHL, but the taxpayers of Phoenix and Arizona. If I were Bankruptcy King, I'd call all of those gentlemen into my thrown-room and tell them that the highest bidder who intends to honor the original lease gets the club, otherwise I'll be cutting Jeremy Roenick in half.